‘J.B.’, The Theatrical Caesar! Or Cassius and Casca in Debate, hand-coloured etching, published by S.W. Fores, London, 1804. 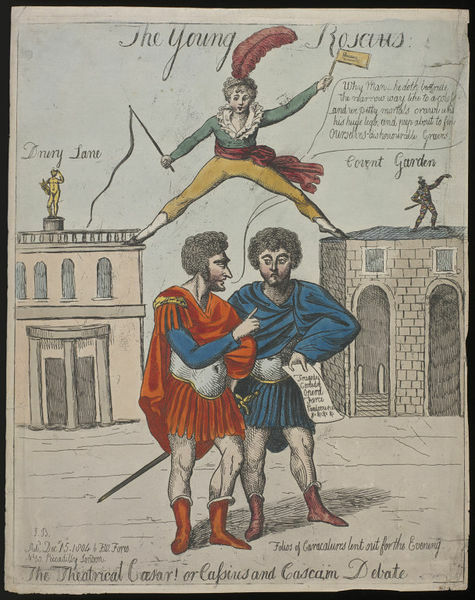 This caricature shows Shakespearean actors John Philip Kemble (left) and his brother Charles (right) as Cassius and the ‘envious Casca’ in Julius Caesar, and satirises their attitude to the popular child star ‘Master Betty’ (top), who astonished adoring audiences with his performances in leading roles, including Hamlet, Richard III and Macbeth. Known as ‘The infant phenomenon’, William Henry West Betty (1791- 1874), made his earliest stage appearances at Belfast in August 1803, at the age of eleven. Managed by his spendthrift father and coached by the Belfast prompter William Hough, he was an unlikely success. Playbills advertised the boy as ‘the Infant Roscius’, linking him to the celebrated Ancient Roman actor Quintus Roscius Gallus, and by association to the great David Garrick, on whom the name had also been conferred. Betty toured in Ireland, breaking box-office records, then visited Scotland, and when he came to England in August 1804 ‘Bettymania’ was rife. The managers of Drury Lane and Covent Garden Theatres were in competition to present the boy in London. Thomas Harris, of Covent Garden, reached an agagreement with Betty’s father but the contract was not exclusive so Richard Sheridan, proprietor of Drury Lane, engaged the young Roscius as well. London theatre-goers now had the chance to compare Betty’s performances with those of established players, notably John Philip Kemble. Kemble had played leading roles at Drury Lane but, when his relationship with Sheridan soured at the end of the 1801–02 season, he bought a share in Covent Garden and moved to the rival theatre. As a lessee he would profit financially from Betty’s performances but he also faced the prospect of being supplanted by a child. Betty arrived in London on 25 November 1804 in a blaze of advance publicity. His first appearance at Covent Garden, on 1 December, caused near hysteria among the crowds. Constables struggled to keep order and Charles Kemble’s prologue to the play, Barbarossa, was drowned by the shouts of the audience longing for their wunderkind. This print, issued on 15 December 1804, shows the Kembles threatened by the dominance of the infant phenomenon. John Philip speaks a version of Cassius’s speech to Brutus ‘Why, man, he doth bestride the narrow world / Like a Colossus’ (Act 1, scene 2), while Betty soars above them, bestriding Drury Lane and Covent Garden like a trick rider at a circus. 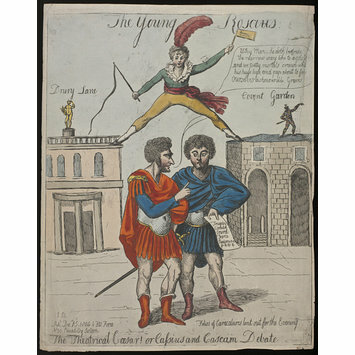 Hand-coloured caricature etching entitled The Theatrical Caesar! or Cassius and Casca in Debate. Two figures in Roman costume stand centre, in discussion. Behind them are two buildings, labelled 'Drury Lane', left, and Covent Garden, right. A young man astride the buildings, one foot on each, positioned so that he appears to rise above the Roman figures in the foreground. He wears a red plume in his hair and holds a whip in his right hand and a rattle in his left.